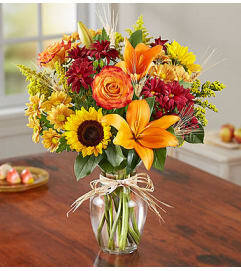 Celebrate harvest season with our lush arrangement of colorful roses, lilies, poms, carnations and more. 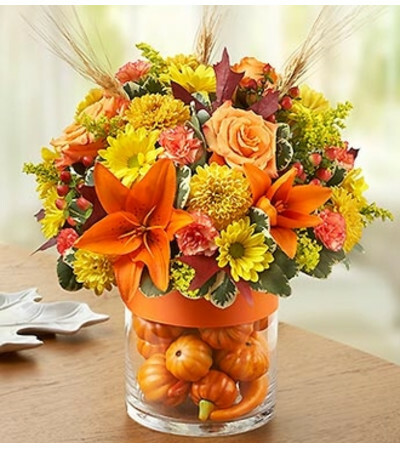 Meant to bring the natural beauty of Fall right to their door, it’s arranged by our florists in a stylish glass vase filled with a cornucopia of realistic gourds and pumpkins. Fresh roses, lilies, poms, carnations, hypericum and solidago, accented with variegated pittosporum and hand-designed in floral foam. 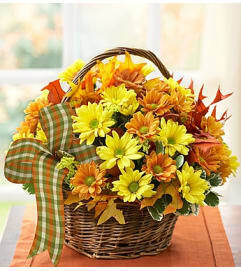 Set in a 6"H clear glass cylinder vase filled with faux gourds and pumpkins and tied with satin ribbon.